PLOT SUMMARY: Former President Frank Underwood (Kevin Spacey) attends a cultish private gentleman's club called Elysian Fields to influence the vote in Ohio. 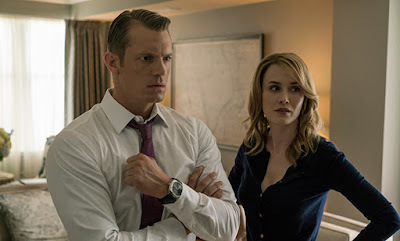 It turns out that Republican presidential candidate Will Conway's (Joel Kinnaman) campaign manager Mark Usher (Campbell Scott) is present but not Conway. Usher clearly states that Veep hopeful General Brockaw is the better politician than Conway. Frank impresses the Elysian members and humbles Brockaw with his rhetoric. A Russian boat looking for oil in Antartica is in trouble. The US is in a position to help and Claire tries to do this in exchange for IT specialist Aidan McAllan (Damian Young). The Chinese tell Jane Davis (Patricia Clarkson) that there's an American on board the boat. Davis tries to broker a deal to save the boat, but Claire refuses to acquiesce to the Chinese demands. The Chinese eventually save the boat. Jane reveals that both the Russians and Chinese wanted the American who was on the boat. Frank gets out of the Elysian retreat and he and Claire listen to the audio of Conway threatening the pilot. They reach out to Mark Usher to lure him away from Conway. Meanwhile, speechwriter Tom Yates (Paul Sparks) tells Claire he loves her and she says he might love him back. Doug and Frank plan Conway's downfall. COMMENTS: "I work with everybody." So Jane Davies remains fascinating. But ask yourself - if Tom Yates were written out of this season would it make any difference? And how on earth can Claire like him at all. This has to be an act!